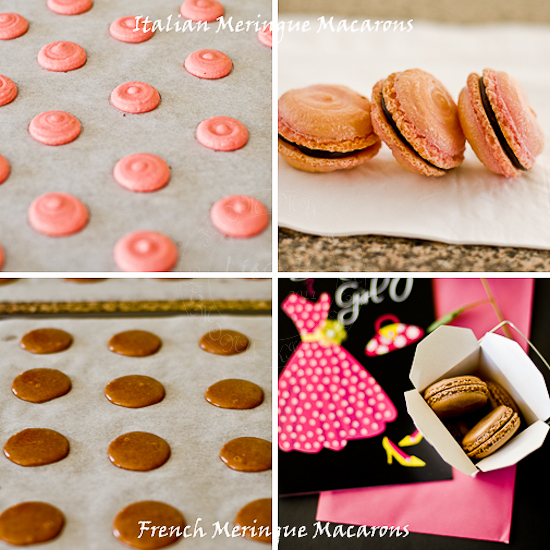 My Macarons journey started in late December 2010...when I was given Secrets of Making Macarons by Jose Marechal as a Christmas present by my sweetie pie, E.
When I finally found my courage... my first attempt was to try out Italian meringue. I followed the 'step by step' stated in the book... they looked good during the drying time 'croutage'... but... Lady Luck was not on my side!! Xiaolu of 6Bittersweets and Rima of Bisous A Toi... responded to my SOS. Rima suggested that I adapt Swiss Meringue... less temperamental than French or Italian meringue. 3rd attempt... back to Italian Meringue. Taking in Xiaolu's advice on the oven hotspot, baking tray and baking sheets...I was getting better results... no more lopsided macarons... except that my mix was not fully incorporated, hence the 'peak'. 5th Attempt ~ based on my little 'victory' above...I decided to take up Rima's suggestion of Swiss Meringue and I remembered reading an article Demystifying Macarons from Helene of Tartelette ... not to exceed more than 50 strokes when mixing. Phew.... this ﻿Macarons making ... reminded me of my first job working under the guidance of Dr Ting, a renown specialist Engineer in KL... He often reminded us... the nerdy, ambitious young fresh graduates to be Precise, Concise and Consistent... in our work. It was a good week... 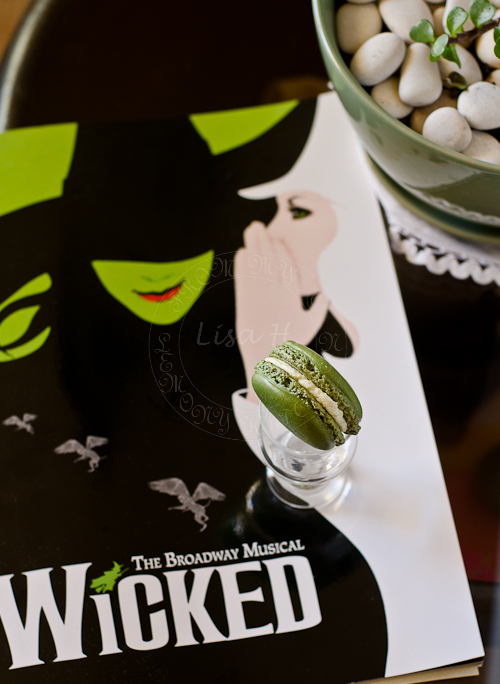 I successfully made my first batch of Macarons, we celebrated our 19th Anniversary and enjoyed Wicked the Musical... Wicked is playing in Perth now... if you have the chance... dont miss it... it was brilliant!! Preparation ~ 3 days before making macarons ~ separate egg white from yolk. Refrigerate. Pulse Almond meal with icicng sugar for 5 minutes. Sieve. Set aside. Mix the egg white and castor sugar in a heatproof bowl. Making sure that the bowl will snuggly fit the pot, bring the water to boil then lower the heat to a gentle simmer. Place the bowl on top of the pot, making sure the bottom of the bowl does not touch the simmering water... aka double boil method. Whisk the egg white mixture until the sugar is dissolved and the temperature reads 50-55C on the sugar thermometer. Transfer the egg mixture into the mixing bowl with the balloon attachment. Whisk on medium speed until soft peak or 'shaving foam' consistency. Using a flexible silicon spatula, fold in sieved almond and green tea powder into the meringue one third at a time. And start counting the strokes. Pour the mixture into a piping bag fitted with 10mm nozzle, and pipe onto prepared baking sheets. Leave the tray at room temperature for 30 minutes or more until the macarons surface are 'drier' to touch. Pre heat oven to 150C and bake each tray for 15-20 minutes depending on the oven. Cool for 10 minutes then carefully peel off the baking sheet. Filling~ beat butter, lemon juice until light and fluffy, then add icing sugar and green tea powder.Piped the filling onto the shells. The green ones look great. Oh Boy !! You nailed the damn macarons perfectly :) The sweet taste of success .... Lovely clicks ! These are absolutely gorgeous macarons! Even prettier on the big screen ;-). Those macarons look perefect and so delicious! Well done. Well done! they look gorgeous! This looks amazing and so tempting! Shall definitely try these macarons!! Lovely blog...very different indeed! Congrats! your macarons look PERFECT! Perfect macarons and lovely green. I'd yet to try baking macarons, must try out soon. Congrats on your perfect macrons! Aren't they also the perfect gift for your Anniversary!? Beautiful! And I love the color! I only attempted chocolate macarons once with the French meringue technique and some 2 month old egg whites. They were ugly and delicious. Maybe next I'll use Swiss meringue instead. Very nice ones the matcha Lisa! Very pretty!! You have done a great job! 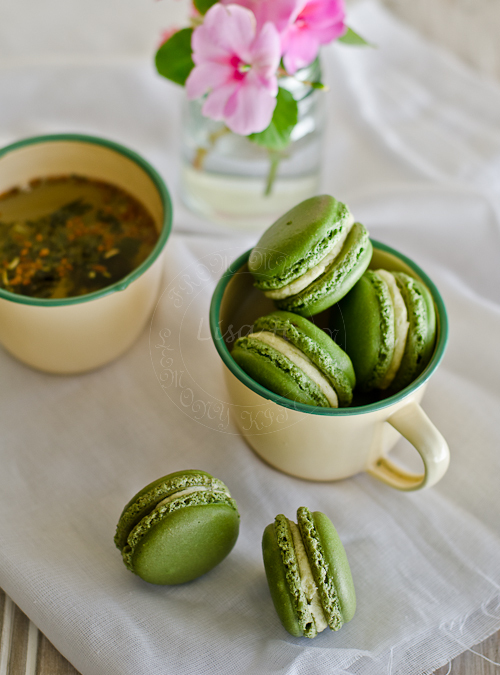 Your green tea macarons look gorgeous! I also like the enamel mugs (first photo) - they send me right into nostalgia. Wow! Your macarons look so perfect! I have been on a macarons baking frenzy of late and having nightmares over the oven temperature more than the macronage. 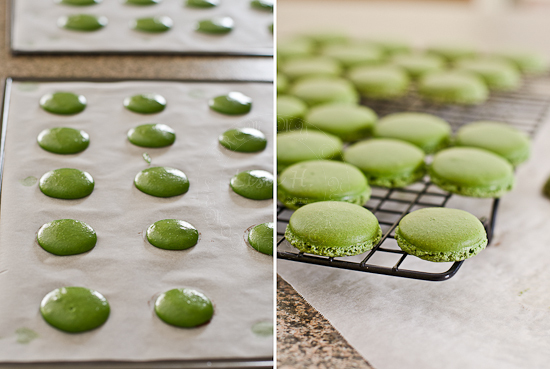 Your green tea macarons turned out really, really well! They're incredibly professional, love the deep green shade of them. hi lisa, what can i say, they are so gorgeous looking! 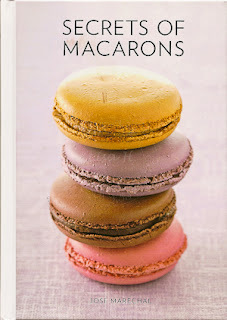 just a few days ago, i saw this book ' mad about macarons' at mph and was so tempted to buy it but i just tell myself , wait, wait..but dont know what am i waiting for? really sounds like a very tricky thing to handle, let me just enjoy looking at you guys making macarons first! They turned out perfect. YUM! Love the vivid green colour, love the tall feet, love the generous filling. You menang Lisa. I want some now. I love anything with green tea and I adore macarons. Macarons are the new cupcakes these days. Perfect looking macarons, Lisa. Green tea is my favorite. how exciting. kudos to you for not giving up. these macarons look wickedly delicious. Your macarons look wicked (yes, sorry, I had to say it). Seriously, they are awesome. I have tried so many times with macarons but have never made one batch that I considered a success. I need to work up the courage to attempt macarons again. Your macarons looks great though! these are beautiful! and naturally gluten-free or is the almond flour your adaptation to make them gluten-free. i've never made macarons before, so i don't what is the traditional way to do it. Hi Lisa! Your green tea macarons are super beautiful!!! Your detail work surely paid off to make such gorgeous creations! I really, really love your photos... I decided to make matcha ice cream instead... a lot easier than these macarons. Oohh I wish I have even just one piece! Good Eye on the Green Tea macaroons. I would have never thought of that and your pictures make me want to eat them right off the screen. I love green tea! Its a great antioxidant. I'll have to make some of those yummy looking macaroons and eat them with my tea. Thanks for the recipe! Hello - your green tea macarons are lovely. 1. Did the lemon filling pair well with the green tea shells? 2. What color green did you use for the shells? Was it a paste, like Wilton, and if so, what color was it (there are several shades of green, not sure which one it was, such as leaf green, kelly green ....).